The Central Coast region extends from Santa Cruz County south along Monterey Bay and the isolated Big Sur coast in Monterey County, to Morro Bay and Avila in southern San Luis Obispo County. Historically, much of the seafood caught in this area was landed at Monterey, where the sardine and salmon industries boomed from the late 1800s to the mid-1900s. By 1950, 25 sardine canneries operated along Monterey’s Cannery Row, with and another 14 at Moss Landing. The fishery collapsed shortly thereafter, shifting effort to other fisheries and areas. Commercial ocean salmon fishing is also credited as developing in Monterey Bay. Today, fishermen continue to target coastal pelagic species (anchovy, sardine and squid) and salmon, along with groundfish and other species. In recent years, the Central Coast region has supported a variety of fisheries, with sablefish, sardine, squid and salmon among the most active. However, the mix of fisheries and level of activity in each port and overall varies as a function of changes in species distribution and availability, regulations, physical infrastructure, market demand, buyers and other factors. See our regional seafood posters and the commercial fishery landings data (links below) to learn more about the fisheries of this region. Ocean waters within the region have both soft-bottom (sand and/or mud) and rocky habitats, including pinnacles, outcrops and canyons, with all of them important for certain fisheries. 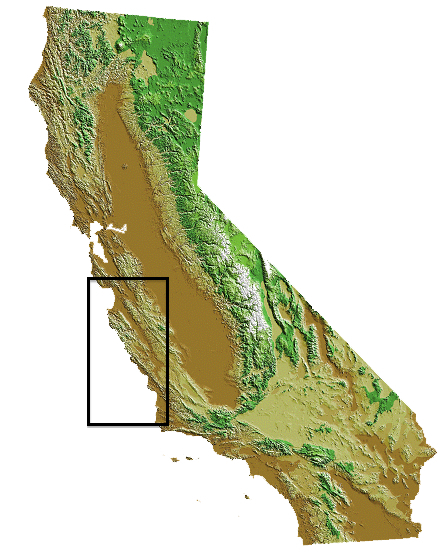 The extent extent of the continental shelf varies: off Big Sur, it is narrow and drops off sharply to deep water, while off Morro Bay, it is broader, with extensive soft-bottom habitat. One of the most remarkable features in the area that contributes to the high marine biodiversity of the region is the mile-deep Monterey Submarine Canyon, which begins less than 100 yards off the coast near Moss Landing and extends about 95 miles southwest along the ocean floor. The canyon's depth and nutrient flows provide extensive habitat for a remarkable variety of marine life, from deep-sea worms to giant blue whales. The region's commercial fisheries are managed by the state through the California Legislature, the Fish and Game Commission and the Department of Fish and Wildlife (CDFW); by the federal government through the Pacific Fishery Management Council (PFMC) and National Marine Fisheries Service (NMFS); or by both (see Management Context for more information). The following table shows which government entity (or entities) has management authority and the management measures used for some of the region’s most active fisheries. California Marine Life Protection Act Initiative (CA MLPAI). 2005. MLPAI Regional Profile of the Central Coast Study Region (Pigeon Point to Point Conception, CA), September 19, 130 pp. Hackett, S. 2002. An Economic Overview of the California Wetfish Industry Complex. In California's "Wetfish" Industry: It's Importance Past, Present and Future, edited by D. Pleschner-Steele. Santa Barbara, CA: California Seafood Council, 65 pp. Pomeroy, C., M. Hunter and M. Los Huertos. 2002. Socio-Economic Profile of the California Wetfish Industry. In California's "Wetfish" Industry: It's Importance Past, Present and Future, edited by D. Pleschner-Steele. Santa Barbara, CA: California Seafood Council, 46 pp. Pomeroy, C. & M. Dalton. 2005. Market Channels and Value Added to Fish Landed at Monterey Bay Area Ports. Research Final Report, California Sea Grant College Program, 18 pp. Pomeroy, C., and M. Dalton. 2003. Socio-Economics of the Moss Landing Commercial Fishing Industry. Report to the Monterey County Office of Economic Development and the Moss Landing Study Steering Committee, 121 pp. Scofield, W.L. 1954. California Fishing Ports. Fish Bulletin 96. State of California, Department of Fish and Game, Bureau of Marine Fisheries, 159 pp. Starr et al. 2002. Trends in Fisheries and Fishery Resources Associated with the Monterey Bay National Marine Sanctuary from 1981-2000. Sea Grant College Program, La Jolla, CA, 156 pp.